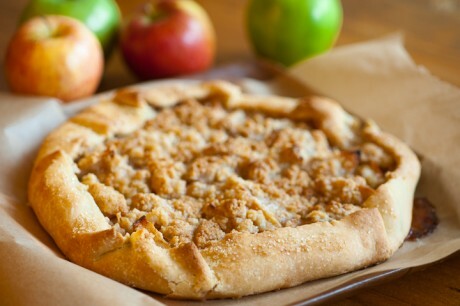 A favorite recipe for fall apples. It's best of you use a mix of apples, and include a few Granny Smith. I've been using the liberty apples from the fruit trees in my yard, and the pies have been delicious. Make the crumb topping ahead of time. You can also make the crust ahead of time too. Tip: roll out your crust right away; then refrigerate. It rolls out easier! Start with your dough so it can chill in the fridge. Pulse the flour, sugar and salt in a food processor. Add butter and pulse until mixture resembles coarse meal, leaving some larger pieces. Add the water and pulse. Then run the food processor just until the ball forms. Sprinkle half a handful of flour onto a piece of parchment paper. Press dough to flatten into a disc and sprinkle some flour on top. Roll out dough to form about a 12- to 14-inch rough circle. Refrigerate on the parchment on a baking sheet for about an hour. Quickly fold/pleat the edges of the dough over onto the fruit, being careful not to tear the dough. Brush the crust with an egg wash or a bit of heavy cream, if available. Bake for about 30 to 40 minutes, until the dough is golden brown.